Visit Melbourne's highly acclaimed Eureka Skydeck and see Melbourne from a completely new perspective from the Southern Hemisphere's highest viewing platform! Perfectly positioned on the banks of the Yarra River, Eureka Skydeck provides incredible 360 degree views from the floor to ceiling windows that overlook Melbourne's CBD, sports precinct, Port Phillip Bay, Docklands and everything in between. You'll literally feel on top of the world as you soak up the awe inspiring views of the great city of Melbourne. Experience jaw dropping views that reach as far as the Dandenong ranges by day, or visit Eureka Skydeck a night and see the beauty of Melbournes skyline nightscape. This exclusive combo package also includes admission to ‘The Edge'. The only one of its kind in the world, The Edge will project you 3 metres out of the building within a glass cube, a staggering 300 metres above the ground! 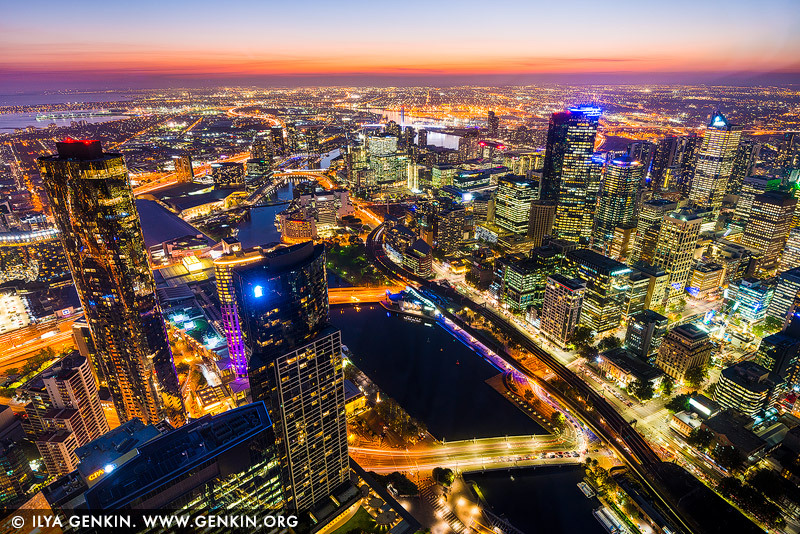 This image id AU-MELBOURNE-0040 of Melbourne City at Night from Eureka Tower, is copyrighted © by Ilya Genkin. This is not a public domain image.